The Blogstroke Annette Griffus covers swimming, from age-group to high school and the Olympics. Pictured above are members of the Bainbridge Island Dive Club that competed at the iDive Invitational meet in Vancouver, B.C., last weekend. 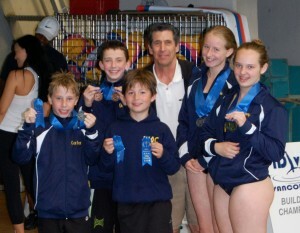 Left to right: Carter Wolff, Duncan Platz, Henry Sauermann, Chris Miller (coach), Jackie Hellmers and Cammy Rouser. Bainbridge Island Dive Club’s Cammy Rouser won two events at the iDive Invitational in Vancouver, British Columbia, during Memorial Day weekend. Rouser won the 14-15 year-old title for the 3-meter springboard with six dives totaling a score of 197.7 points. She also won the 1M springboard with seven dives and a score of 253.6 points. BIDC’s Jackie Hellmers was second in the 3M with 187.25 points and third in the 10 with 153.35 points. On the boys side, BIDC’s Carter Wolff placed second in the 12-13 year old 3M springboard (five dives) with a score of 160.75. Wolff was also fifth in the 1M event, scoring 133.8 points. Also in the 3M Duncan Platz scored 158.75 points — good enough for third place. Platz also placed third in the 1M with a score of 148.6. Henry Sauermann placed fourth in the boys 3M 10-11 year-old division with a score of 118.75 points. He was also fifth in the 1M springboard with 108.8 points. “We have a young, hard-working team that supports each other very well. I expect you’ll hear a lot more from these kids,” said BIDC coach Chris Miller. The club team is comprised of divers from Bainbridge Island, Bremerton, Poulsbo and Kingston. The club will be participating in diving meets through July. Next up is the Summer Junior Region 10 Championships in Santa Clara, California on June 13. That meet is part of the qualifying system for the national championships. Annette Griffus has covered swimming since 2001, from age-group to high school and the Olympics. Will Michael Phelps compete in 2016 Olympics?